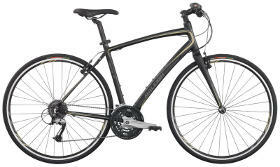 Q. I am a woman shopping for a new bicycle; do I need a women's-specific model? 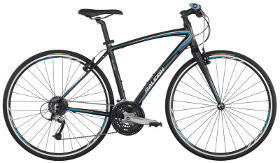 There are certain advantages for a woman to choose a women's-specific bicycle. The first part is sorting out exactly what is meant by the term "women's-specific." This phrase has evolved over time to mean different things to different people. 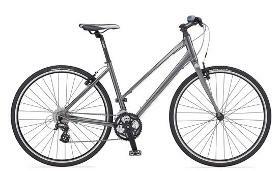 The following information should help you makes sense of what different women's-specific features are available on different types of bikes, and how to choose the one that is right for you. 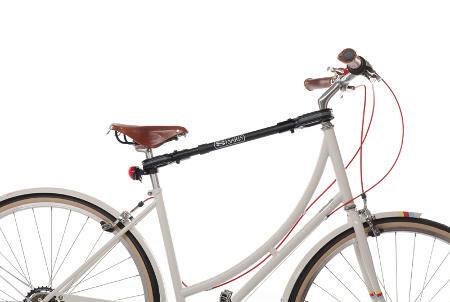 Notice that even on the "men's" model avoe, the top tube still has some bit of slope; this is common on many styles of modern bikes. You can see the significantly more-sloped top tube on the "women's" model, however. 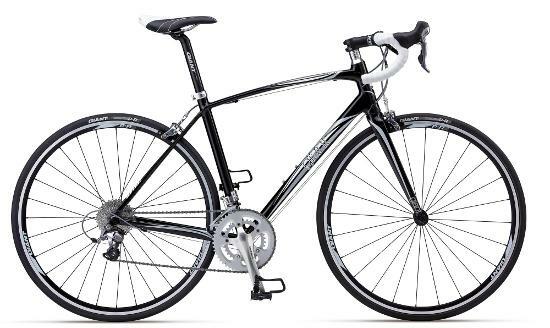 Notice how the women's model on the right has a straight top tube compared to the women's Raleigh Route 4.0 above, but it still slopes down considerably more, to meet the seat tube at a lower point. The most common misconception is that women's bikes are designed this way for safety reasons. If you think about it, men have just as much to lose from an unplanned impact with the bike frame as women do! The real reason that women's frames were made this way goes back to the late 1800's and early 1900's, when women wore long skirts when they rode bicycles. The extra clearance in the frame made it possible to maintain modesty while pedaling in a skirt. Women's bicycles are still available today with this style of frame, mainly out of tradition. Some women have a greater perception of safety on this type of bike, even though they are unlikely to ride while wearing a skirt. Regardless of whether you are a woman or a man, you should be able to safely mount, ride, and dismount any standard bicycle, as long as you are properly sized and fitted for that bicycle. The bicycle industry has been moving toward making the terms "men's" and "women's" bikes obsolete. 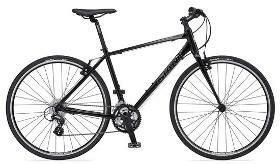 What used to be called a "men's" bike is now preferably referred to as a "unisex" bike or a "standard" frame; what used to be called a "women's" bike is now perferably referred to as a "step-through" frame. One of the main reasons for this is that there are some men who prefer a step-through frame. Examples are older men with arthritis, those who've had recent hip replacement surgery, or other conditions that limit flexibility. The step-through frame makes it easier for people in these situations to mount the bicycle, because you can, well, step through the frame, rather that having to swing your leg over the seat. 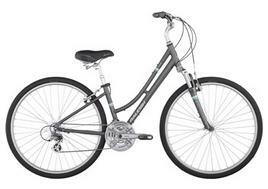 As a result of this trend, many step-through bike models are now available in "gender-neutral' colors, such as the grays pictured above, rather than "girly" colors like pink and purple. Whether you're a man or woman, if you want the flexibility to be able to wear anything while you ride (such as a business suit with a skirt, a sun dress to go around town or to the beach, or even a kilt! ), then a step-through frame is still a practical choice. 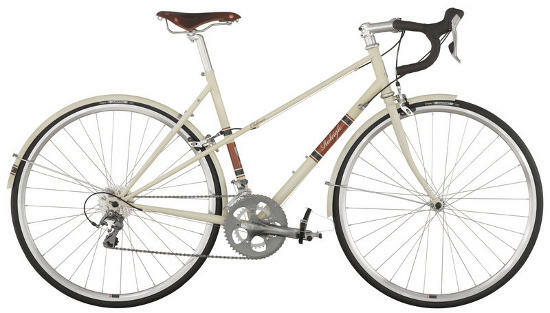 There is another style of "traditional" women's bike similar to the step-through style frame, called the mixte frame (pronounced MIX-tee). These are not very common among modern bikes; you're more likely to see them in vintage collections, although due to some nostalgic demand, some manufacturers are bringing back mixte models. The distinguishing feature of a mixte frame is that the top tube is actually two separate pieces, which run past the seat tube and attach to the frame near the back of the rear triangle. Use a "frame adapter." This is a device that attaches to the bike between the handlebars and seat, and provides a temporary top tube that allows the bike to more easily attach to most common car racks (see photo below). This is a relatively inexpensive solution, but it does involve a little extra time and hassle every time you need to transport the bike. Plus, in some cases, the adapter bar makes the bike hang too low and close to the ground, which increases the risk that the tires will rub on the pavement while you're driving, or in the worst case, cause the bike to be knocked off the rack completely. Use a roof rack. This is the most versatile solution, but the cost of roof rack systems is a deterrent to many people. The need to lift bikes up high to get them onto the roof is also a deal-breaker for some. Use a platform-style rack. These racks hold the bike by the wheels, similar to a roof rack, but they are available in both hitch-mounted and trunk-mounted styles. About a decade ago, bicycle manufacturers started to heed the frequent feedback they were getting from their female customers who wanted performance-oriented bikes that worked better for them than the "standard" models of high-end bikes. One of the most common problems for many women was finding bikes with an appropriate size range to fit them well enough. Many bike companies' first response to this issue was to produce a women's-specific line that was basically the same as their standard models, but available in smaller sizes, and with more feminine-inspired colors and graphics. This era is now referred to (derisively) as the "shrink-it-and-pink-it" strategy, although this method is still used on many entry-level women's road and mountain bikes. Fortunately, the industry has come a long way since the shrink-it-and-pink-it days. There are now bicycles that are designed from the ground up to meet the needs of women riders. One way in which this can be done is by adjusting the frame geometry of the bicyle to provide a better fit. Note that not all women's-specific bicycles will have all of the above features. 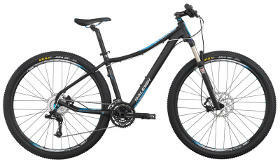 The design and components will vary from one style of bike to another, and will vary according to price range. 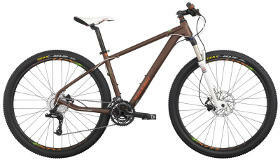 Women's-specific designs are not limited to the performance road bikes pictures above; they are also found on fitness, hybrid, commuter, and mountain bikes. 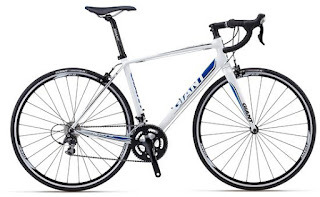 Note that the design of some women's-specific bikes makes them appropriate for some men, who may have atypical body proportions, or are shorter in stature. For this reason, some men may choose to ride a women's-specific model. Just like with the step-through models mentioned above, many women's-specific models are available in gender-neutral colors, so that nobody would ever know that you're riding a women's bike. By the same token, some women will have better luck with a standard, i.e. 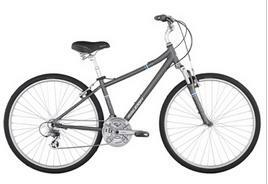 non-women's-specific bike. We've also found that many women prefer the gender-neutral colors, while just as many like the feminine colors. In fact, the shrink-it-and-pink-it strategy worked very well with some women, and there is nothing wrong with that for those women for whom those bikes are meeting their needs well. For many women, good results can be achieved by taking a standard bike and swapping the stem or other components to make slight tweaks to the fit. These changes are sometimes beneficial even when starting out with a women's-specific model. Every body is different, and different strategies work better for different people. The moral of the story is that there is a wide array of bike options available to meet the needs of riders of all abilities. Talk to your bike sales person and/or mechanic about what you're looking for, and discuss with him or her any issues you may have had with bikes you've owned in the past. At Century Cycles, we welcome and encourage test rides, so try as many bikes as possible to compare and contrast the different models, and determine which women's-specific features are important to you, and which ones may not be.